The centerpiece of eTourChatham is the Chatham Highlights Tour, a smartphone tour that includes, as of June 2012, 50 of Chatham’s many points of interest - historic, contemporary, and scenic. More sites will be coming later - follow eTourChatham on Facebook and Twitter for the latest news on updates. Full details about eTourChatham - how to use it, supporters, credits, and contact information - are located under the “Intro & Info” tab on the Home page. On each page of the Chatham Highlights Tour, an audio track accompanies the text. A Google map also identifies all the locations, and each point of interest has a page of information - an address, picture, and explanation of its interesting features. Look for the Navigation bar on the bottom of each page, in black. For Chatham’s 300 years as a town, its character has been strongly defined by its location by the sea. 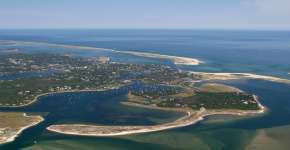 Although the first European settlers were primarily farmers, the original Wampanoag people fished, and Chatham’s new population turned to the sea only a few generations after its first European settlers arrived. So much of what we see today in Chatham, from its history to present-day, is connected to its location by the sea. eTourChatham does not filter Chatham through this lens, but it is interesting to reflect on how many of Chatham’s points of interest, both historical and contemporary, reflect this character. Fishing has been a constant - from livelihood to industry, fishing has been part of Chatham’s character since before the first Europeans arrived. The relocation of the town center to the Old Village happened as a majority of the population became sea-faring, and the sea captains homes that survive today are a part of Chatham’s unique historic districts. Large tourist hotels came along - wanting to be near the water; also large summer homes with water views - Marcellus Eldredge and Joe Lincoln being early examples. As you enjoy finding your way around town with eTourChatham, think about how so many of Chatham’s features past and present are connected to its location by the sea. Harbors, boat yards, and salt works. Beaches, sandbars, and breaks. Coastal wildlife - once giving rise to hunting parties, now a protected refuge. Seals, sharks, terns, and piping plovers. Press the “Next”, “Map”, or “Sites” button at the bottom of your screen to continue exploring the Chatham points of interest on this first release of the Chatham Highlights Tour.